Angela always tries to keep Mara enrolled in some physical curriculum. I think I mentioned before that Mara has taken soccer and dance classes and lately she has been taking a Tae Kwon Do class at our gym. Wednesday we realized it was the last class and I had not yet got to see Mara participating, so I bagged out of work early and caught a bus. Angela brought the camera and I met up with them there. Mara was excited that I was coming. She had shown me her Tae Kwon Do uniform weeks ago, but seeing her in it, seeing her make her kicks and punches, was a moving experience for me. When I was in fifth or sixth grade, I was afraid of Roger M. and tried to avoid eye contact with him. Roger had long yellow hair, the longest hair of anyone in school, and a mouth that was always smiling or yelling happily. Looking back now, I realize just what a jubilant character he was. He liked to have fun. He was not a grumpy or vengeful person, and not menacing. He was like a popper filled with confetti. He would not think about you unless he saw you, and if it occurred to him to exercise dominion over you in some festive, experimental way, he would just go ahead and do that. I sat at the same table as Roger in Mr. Llewellyn’s class. Once while I was eating my ham and cheese sandwich, trying to be invisible while Roger and the others at the table talked and joked, he up and smacked the sandwich out of my hand, and laughed heartily, as though this were an experience we would both enjoy sharing together. The sandwich separated into its little triangular parts as it flew across the room. He did not hurt me. I cannot say that I suffered from extreme hunger that day. But it was that kind of sudden, explosive, violation of my personal space that kept me in terror of him. Roger had a loose band of cronies that went about at recess destroying school property or hanging other kids on hooks by their jacket collars. One day, for reasons that never existed or that I have forgotten, I found myself being carried by Roger’s thugs to a large mud puddle that lay near a large fir tree in the southeast portion of the playfield. The talk was all about throwing me in. I remember the fear. I did not fear mud puddles. Indeed, try as she might, my mother could not by any means keep me out of them when I went outside to play on my own street. I feared the indignity, the loss of my power, the embarrassment. I used to think I hated Roger, but looking back, I see that it would have been impossible to hate him. He was like a cheery pirate. He was dangerous. I feared him, and I was storing up a vast quantity of rage at that time of my life against injustices such as this, but I believe now that my anger was at God, for not protecting me. Before Roger and his henchmen could release me into the quagmire, I was rescued by Mark H., a tall, popular, hero-shaped person who was similarly attended by a number of hangers on. Mark’s men appeared and demanded my release, and Roger’s men stood down. It is impossible for me to remember this exchange accurately because I see it as cinema. The thugs chuckle and make some cracks about just having a little fun. The righteous savior issues a stern reprimand, the thugs shuffle off. I do remember that as recess ended I was walking back with Mark’s contingent, they surrounding me as though I were a president who had just nearly been assassinated. They didn’t know me or care that much about me, but the moment was a high one; they had been agents in averting an injustice, and they were all feeling pumped. Ken P. was walking beside me and he said I should take Judo classes. He said he did and it taught him how to defend himself. I could take them at the Bellevue Boys Club. And so I did. I took Judo lessons so that I would be able to finally not be picked on. I would tear mine enemies into bits, and when I trod the playground great would be the trembling of them, and their knees would smite one against the other. We had to kneel and bow all the way to the ground before a framed photo of some Asian man. I’m embarrassed to say that to this day I do not know who it was. I imagine him as the Emperor of Japan. Having been raised as a fundamentalist evangelical Christian, I felt uneasy about what felt to me like outright worship, but I bowed with the others. For me, there was no disaster worse than not fitting in. We practiced falling safely, which we achieved by rolling a somersault over one shoulder and then slapping the mat. We also paired up and practiced flipping each other by grabbing our opponent by the lapels of their white Judo suits, turning, squatting and guiding them through the inevitable path overtop of our lean and lethal frames. I hated going. I was no good at this and I feared the matches. I was tallish, but I was practically weightless in 1975. I had no mass to leverage against my opponent. I went to matches and consistently lost. 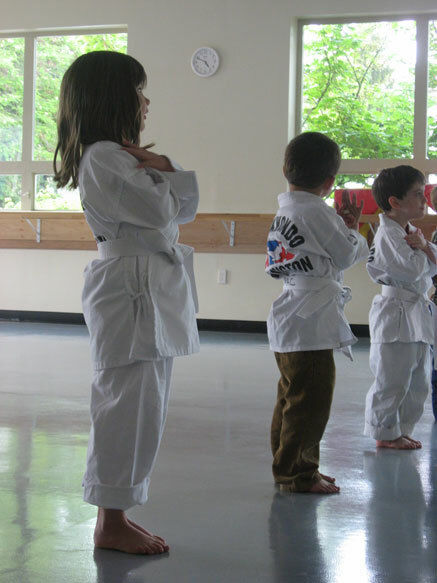 Other kids I knew moved into the colored belts — yellow, orange, green — but I remained a white belt. There was a neighborhood bully who taunted me across a thigh-high wooden fence one day, he standing on the downhill side and me the up. You can see, I’m sure, the inadvisability of attempting to hoist over your shoulder an opponent who is standing downhill on the other side of a fence. But that was the moment I chose to unsheath my Judo skills on the battlefield. I engaged him, we grappled, and he ended up pulling me over the fence and depositing me in the moist, soft, mossy lawn. Mara loves to “rough-house” with me, but I’m going to start having to wear padded clothes. 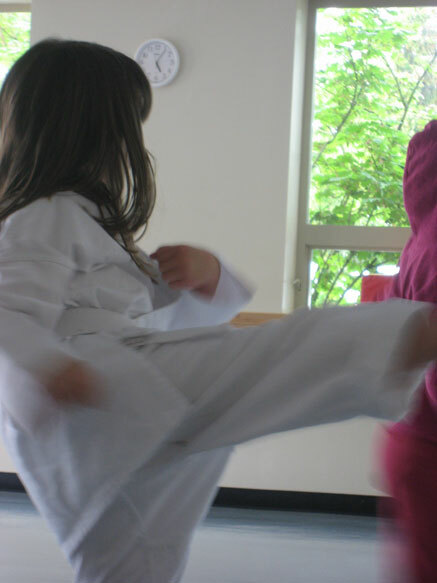 Mara loves Tae Kwon Do because it is physical and fun, and because she is attracted to an order internal to it that is revealed in the person of her instructor, Ms. B. It was a marvel to hear the children shout “Yes Ma’am!” after every instruction she gives them. It is a marvel to watch them slap their hands to their sides and bow sharply and with grace. It is a marvel to see how the children, especially Mara, understand the tensions and bracings, the physical logic of the stances. It is all joy. I know nothing of Tae Kwon Do, and I don’t even know if there is ever an opponent as there is in Judo. At this stage it is mostly individual movement with occasional outside stimulus. Near the end of the class, Ms B. wore big pads on her hands, asked the students to queue up and approached each child in turn pinwheeling the pads alternatingly, left, right, left, right, low left, high right. The children were to use their fists to bat the pads away. She was gentle but persistent. The students, some of them younger and much smaller than Mara, loved this pillow fight. One boy could not stop giggling as Mrs. B. pummelled him. I never internalized any such promise to myself or anyone else in my young Judo days. I brought my fear to it, and my fear bred more fear, and finally a sense of failure. I learned to avoid physical fights but, to my detriment, I also continued avoiding discipline and effort as well. 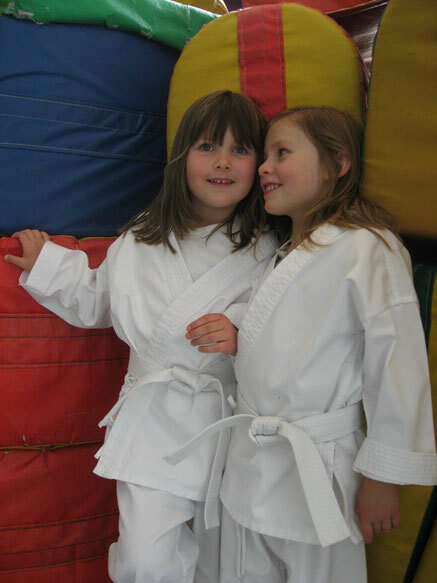 The tae kwon do robes give the illusion that these children are not perpetually smeared with tomato sauce and egg-yolk. Until they wear wedding gowns, this is about the only time you’ll see them clad so cleanly white. Imagine my surprise when Roger asked me one day if I would accompany him to an afterschool Bible camp. I couldn’t imagine why he, whom I regarded as a soul bound exuberantly for the Pit, was attending a gathering of Christians. Maybe he couldn’t either, but he said he would get a prize if he brought someone else, and since he knew I was already a Christian I was the only one he could think to ask. I rode my bike to his house, which I had never before visited and would never have believed that I would ever want to, and we rode — of all places — to Mark H’s house. It turned out my faith tribe included Mark H., or at least his family, who were hosting the camp. It made sense, the hero rescuer would be among the Saints. But in truth, I never felt any kinship or even friendship with Mark, and in seventh grade he found out about a crush I had on the eighth-grader Carolyn D. and shamed me in front of my entire Spanish class with a big grin on his face. I don’t know what ever became of him. What a great post. People can really surprise you at how much they are actually like you, for sure. Thanks Lisa. Yes, that’s a lesson I wish I had learned earlier on. That’s part of why I like the pledge so much. Boy, THAT brought back a memory or two! Well, the part about Roger. I, too, had a mortal fear of the young man. We had art, or algebra, or some such together, and I was always in fear that something would happen. I believe he was behind me being shoved on top of the lockers in the 7th grade. But you’re right, now, it does seem like he was a cheery pirate. I don’t recall that he projected any meanness, but there was something to fear. 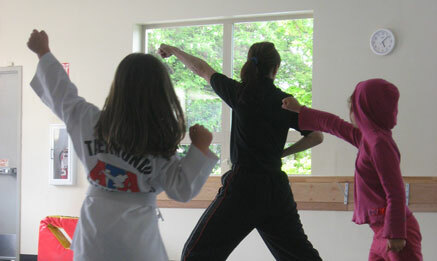 Yes, padded clothes may be necessary from now on, and it would seem that the instructor is teaching the kids to use their new found power with care, not just to “beat people up”! And I’m sure my daughter will find a way to get some tomato sauce on her wedding dress somehow! It surprised me that you’d had direct experience with old Rog, because our scholastic rivers did not merge until seventh grade, and by then Roger seemed to have become for me a non-issue, terrorwise. At least for me there were larger sharks in the water once we hit Bellevue Jr. (Some of Louis’ yearmates were outright hooligans.) But I see that you get what I mean about Roger, even after being hoisted on top of the lockers. For him that was probably just a joyful experiment in live stowage. Yes, Mara has no notion of defending herself from actual danger yet. She knows to listen to her gut about approaching strangers, but she has not yet been bullied physically, so the class is all about the joy of kinesis for her. Hopefully she will instinctually connect the moves with the need if it ever arises. Excellent read. You’re looking back with a very honest heart I might add. I have learned the same lesson, in an altogther different manner. Remember I took boxing for the same reasons? Dad thought it would help me. I did use those skills to Adam C.’s detriment one day. He had spilled my books 3 or 4 times that day and I had really begun to feel a “loosening” of the bonds that kept hands at peace. But it was the taunting I recieved from Erin’s little brother that really helped me snap. I have not struck in anger often, but that was certainly the moment of reckoning. I only stopped pummelling Adam C. because I became aware that he was not striking back. Unfortunately for him, this was some time after my first swing and his face was the main target for a prolonged period as my brain took a bit time to register the fact that it was a one sided event. I then ran to my next class, in fear of retribution from the Principal’s office. Ironically, I have found that “boxing” is not a popular tactic among hooligans. They much prefer to wrestle. I don’t wrestle well, my instinct is to punch (considered poor form in a wrestling scuffle). The difference I remember was that there was no common sense among these boys. They were not carefree like Roger, their faces took delight in others pain, I watched it time and time again. And once I stood my ground, however fanatically, they never came at me again. I would like to hope, that life has taught them to be less vicious, just like it has taught me to understand “forgive them, they know not what they do”. A gripping vignette, Ben. I think the key for me is honesty, which is why I wove my own story around Mara’s. You did what you had to do in the moment, and you were true to yourself — the unfairness was corrected. For you, this came through your fists, not a solution you could take as a model for your later adult life, but it cleared the air. For me, this righting never came. I learned to duck, weave, avoid, and joke my way out if cornered. What I wish is that I had just stood fast and spoken my truth, even if I had had to take a drubbing. I’m glad I never hit anybody. I just wish I had not spent so much time tiptoeing around. It was a resort to dishonesty that had far-reaching repercussions in my life. Your quotee also reminded us not to fear those who can destroy the body but to look to the protection of our souls. I got away without a scratch on my chrome, so to speak, but my carbeurator got way out of adjustment. This entry has made me smile quite widely- “cheery pirate” indeed! Girls had those experiences as well, unfortunately…and I sympathize as well as relate to this. Someday perhaps I’ll view Julie P. with as much kindness as you do Roger! I’ve heard reports that corroborate what you say, and I’m quite sure I would not have made it as a girl. I mean survived it. Funny, people have quite picked up on the “cheery pirate” theme here, but after writing all this it was only this morning that the term “Jolly Roger” came to my head, and this only after I was considering how to amend the last paragraph to create a more visual image of Roger’s hair flying out behind him as he rode. I was searching for a metaphor (“flying out behind him like…like…like…”) and then I thought, “hey, tie it in with the pirate theme with that skull-and-crossbones flag, what do they call it? The Jolly R– oh.” In the end, I decided it was too obvious (although you’d have thought it would have occurred to me sooner). What did Jule P. do to you? You can tell us. We won’t laugh. OK, we will laugh, but you should tell us anyway. And did you take Karate because of it? Oh, nothing fun but nothing extreme: name calling, following and taunting, pushing, shoving, general humiliation in front of my peers. Ironically, a mud puddle was involved once- that was actually traumatic, but then I’m a girl. And I was prim and neat. And oh-so-shy. No karate- I doubt I even told my parents, or if I did I just cried incoherently and they told me to ignore it. The usual girl B.S. that happens frequently in grade school and what we called jr. high! Clearly I got over it…. (she says as she Googles Julie P and plots an intricately detailed revenge scheme just like in the movies that probably involves a life size mouse trap). I remember going to marks house that day.I think pirate is a good description and the sandwich of witch you speak seems to be the tip of the proverbial emotional iceberg of our childhood memories.Wow I am impressed this brings up so many feelings and Questions.Please call me Matt.You must be proud of your daughter. Great to hear from you and to chat briefly on the phone. I got memory whiplash hearing your voice after thirty years. (It’s still the same voice — how is that possible when we shed our skin every day and become different people over time?). I’m glad you liked the story. Feel free to add your own perspective if I’ve misstepped at all. And thanks for commenting. That puts a really great finish on this post! And yes, Mara is a treasure we are grateful for every day.